Also included was a detailed instruction manual/ information guide on worms. The worms themselves arrived via first class post, safely ensconced in moist soil in a sealed plastic tub. The accompanying instructions made it clear that they should be transferred to the established wormery at the earliest. Or be stored in a cool place till the wormery was set up. We lost no time setting up our Worm World. I read all the instructions carefully a couple of times (I didn't want to get this wrong- it was to be home to little living things, after all). My son helped dig soil from the garden and needed little encouragement to get his hands dirty. He helped layer the sand in, alternating with moist soil. I then gently coaxed our wriggly friends out into their new home. The speed with which they disappeared down the layers of soil was astonishing. J fetched a bunch of leaves for them to munch on. We closed the lid as instructed, covered the worm house with the card shade and kept it in a cool place away from direct sunlight. We have since seen the wriggly creatures burrowing through the layers of soil. Most of the leaves have disappeared and have been replaced by a fresh lot of dried leaves. J checks on his new friends every evening after school. We make sure the soil is moist and there are enough leaves to eat. He watches with intrigue as the worms move away from the exposed areas to the cooler, darker inner recesses of Worm World. He spots tunnels and has noticed that the layers of coloured sand are no longer distinguishable from the surrounding soil. Our worm friends have been hard at work doing what they do best - turning soil upside down and inside out, making it healthy and nutrient rich. Just perfect for growing plants in. We will keep the worms for a month or so before returning them to our garden. Who knows, we may rebuild Worm World in the future. Only this time, the worms will not come in the post. We will look for them in our garden, like true naturalists. I am a huge believer in play-based learning. Worm World by Interplay UK provides just that. 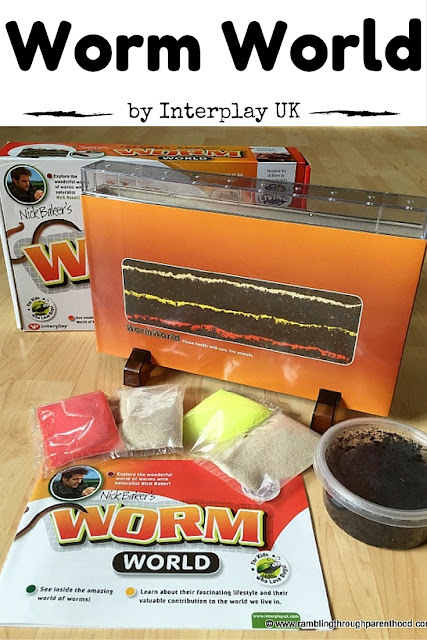 An opportunity to take a closer look at worms, how they live and what they do. It is also a great way to get young children interested in the living world, especially mini beasts. That they are caring for another living creature is a fantastic way to establish a sense of responsibility and respect for all life. Disclosure: We were sent a Worm World for the purpose of this review. All opinions are my own. Ok this is quite interesting. I have never heard of a worm world before. I used to love this as a child. Now my little cousin has this too, and i always overreact because well its worms. But as you said it gives the child a sense of responsibility which is essential for his development.